Ringtone Media Studio 2.2 free download. Ringtone Media Studio was developed to let you personalize your cell phone with your own ringtones, wallpaper, screensavers and video clips. Ringtone Media Studio was developed to let you personalize your cell phone with your own ringtones, wallpaper, screensavers and video clips. Ringtone Media Studio is the ultimate mobile media creation tool for your cell phone. Includes three powerful editing studios for composing polyphonic and real music ringtones, creating wallpapers and editing video clips. Transfer to your cell phone is easy via bluetooth, infrared or cell phone data cable. Ringtone Media Studio is pre-configured for more than 450 major cell phones and supports all major cell phone brands. The software includes thousands of free ringtones, wallpapers, screensavers and video clips to get your started on your own creations. Import sounds from your favorite CDs or the Internet and turn them into ringtones. Record voices, add special effects and mix tracks. 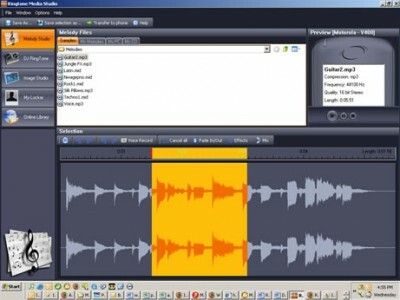 Use this music editing software to compose either MIDI or MP3 ringtones, depending on what your cell phone supports. Join the video ringtone revolution! Audio ringtones are yesterdays news modern cell phones allow moving pictures combined with audio to be used as ringtones. Are you tired of the limited selection of ringtones on your cell phone? With My Ringading, you can create truly unique ringtones that stand out in the crowd. Use your own music, sound effects, movie clips or gaming sound effects to create unique ringtones for your mobile phone. Halloween Ringtone XE is a collection of free key press ringtones for halloween. Quick Ringtone is an EASY TO USE Tool that can convert audio to mobile phone ringtone. Convert to Ringtone Wizard is a useful software which allows you to convert your music to WAV, MP3 and MMF ringtones and upload them to your mobile phone.